Don’t let the holidays make off with your entire savings account this year! The Family Christmas Gift List is a comprehensive template that allows you to make the perfect budget, specifically suited to your financial situation. In just a few minutes, you can prepare the perfect holiday budget for you and your family to enjoy. By analyzing your expenses and shopping habits during this time, you can begin to allocate funds that might have been lost to the holiday spirit of spending and use that money on more important things, such as gifts for your family, a nice vacation, and much more. Don’t succumb to holiday spending, master your budget this year and spend your time on something that truly matters, your family! 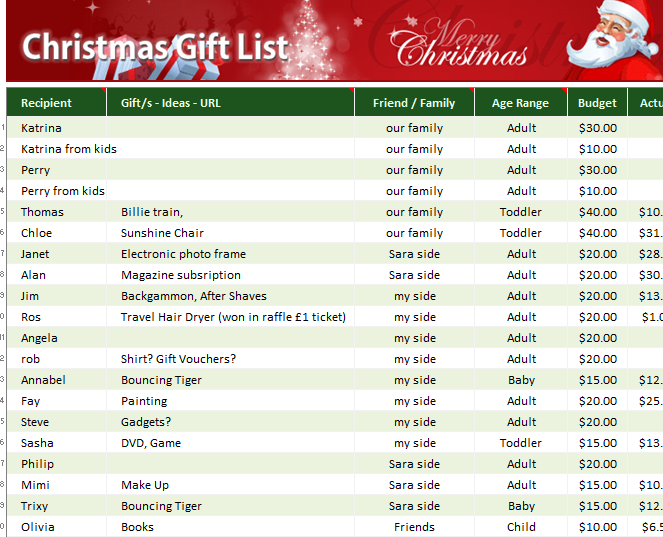 Start by downloading the Family Christmas Gift List file, located at the bottom of your screen. All you need to do is click on the link provided, and the Gift List will automatically begin downloading to your computer. The first step to editing your document is listing the names of your gift recipients in the far left corner of the page. Once all these names have been listed in the first column, you can list your gift idea under the “Gift/s-Ideas-URL” column. In this section, you will enter your gift idea and the URL of your gift if you plan on purchasing the item online. The template will also provide you with a convenient drop-down list of categories, in the “Friend/Family” to sort people by their relation to you. This will help you prioritize your gift selection when you get around to shopping. The “Age Range” column is intended for a similar use. Just select their age from the drop-down menu as well. The “Budget”, “Actual”, and “Budget?” columns are intended for you to list an initial budget for that individual, enter the actual amount you’ve spent, and the last column will automatically calculate the difference between these two figures. The holidays are finally made easy for you! Don’t let holiday spending ruin your fun this year! Get this Gift List now to make your year one to remember! Make a personalized holiday budget for you and your family this holiday season!